« Does Gold Always Go Up In Recessions And Depressions? It really puts last year’s crude oil bubble into proper perspective. 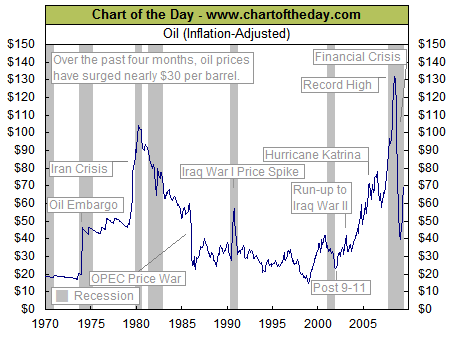 Not only was it about 30% more intense than the 1970’s oil shock, it towers over the other price spikes we’ve seen. What is even more peculiar is that this bubble was entirely artificial. It was not due to any geopolitical rationale, nor was it because of a supply/demand imbalance. It was entirely concocted out of thin air by large traders. The world economy was fragile because of excess credit and speculation. Oil was the first domino to topple and knock the others down by slowing down the economy to reveal the rot under the surface. If it wasn’t the main cause of the worldwide economic slowdown, it was definitely one of the leading reasons for its severity. Although the connection needs no explanation, you can clearly see that every single recession was either preceded by or coincided with a large increase in the price of oil. The crazy part of all this is that no sooner had the dance ended that the same players started dancing all over again. Hedge funds and large players are once again stampeding back into crude oil and commodities. After bottoming in February 2009, crude oil has doubled in price! That’s a little over 3 months ago! And once again, there is absolutely no rationale for such a move. What? Have we suddenly lost our previous reserves of oil? is production somehow curtailed by war? or geopolitical unrest? or perhaps the market believes that the world will suddenly consume much more oil than it did before the recession? As a trader, we don’t really care whether there is a legitimate move or manipulated by deep pockets. But at the same time, if you’re going long and letting the trend take you for a ride, just remember the difference between turkeys that get caught up in a tornado and eagles. One comes down to earth with a thud. The other soars majestically, landing at a time and place of its choosing. Excellent blog here, and I’ve recently become a regular reader after reading one of your seekingalpha article. First time commenter here. Usually, I find what you say to make sense and/or be a highly persuasive argument. Here, I think you are way off, and to be honest, I’m genuinely curious if you’ve really done any of the in-depth fundamental work to say the move was entirely artificial. I think the final blast-off from 100-150 was too much but pretty much the rest of the move was a rational response to the underlying supply/demand dynamic if demand growth had continued at its 2002-2007 pace. If you haven’t done so, you should take the time to pretty much read everything Matt Simmons has written on this subject. I suspect 5-10 years from now, we’ll see $200-$300 oil or more, and people will still be claiming it is an artificial move or created by “speculators” instead of realizing it is a supply issue of the world running out of *CHEAP* oil. It’s funny. The geologists/scientists who’ve actually gotten into studying the field by field supply numbers are all pretty much on the same side of the issue here, and it is mostly economists and traders dealing in theory who come out on the opposite side. But hey, different opinions are what makes a market, and there is a long-term opportunity here for those who get this right. I think it’s impossible to determine the part of speculation in a move, but when it’s parabolic and everyone refuses to admit it might be a bubble, then the speculation is very big; I am new to stock markets, but the implosion we had from 150 to 35$ in such a short amount of time just shows how big the speculation in this market was imo. Today the big speculators are back and the “hyperinflationary” trade is very crowded again. Watch out below. While I acknowledge that the supplies of crude oil will inevitably run out, there is no justification for the idea that crude oil prices will skyrocket as a result. This theory is not only closed minded, separating the oil industry from the rest of the world and the innovations it contains, but it ignores every lesson we’ve learned from history. It is also interesting that peak oil theorists disappear when the price of oil falls but they magically reappear when it rises. They can’t explain half of the movement in oil prices. With so much money handed by the FED, it’s not wonder the speculation is so intense. It’s true for the stock market as well; once we moved 30% in a direction, all kind of people show up trying to explain the movement (it’s their job in the end to comment on stocks). They were absent of course at the beginning of it. These are signs the movement is close to a top.